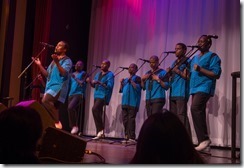 Last week, Ladysmith Black Mambazo brought a bit of South Africa to Chicago. The vocal group performed at The Old Town School of Folk Music Saturday February 11. LBM was formed by Joseph Shabalala in Ladysmith, South Africa in 1964. Shabalala did not make this trip, but a number of his sons still perform with the 8-man group. Westerners learned of their talents in the 1980s when they recorded the classic "Graceland" album with Paul Simon; but they have been touring and recording on their own for decades. Their tight harmonies and blend of African and western music make them appealing to audiences all over the world. LBM delighted the audience in a too-short (about 80 minutes) performance before a sold-out theater. They blended harmonies and melodies and humor and Zulu dancing to entertain us. There were no instruments because there was no need for instruments. They sang some songs in English and some in the Zulu language. "Homeless" and "Diamonds on the Souls of her Shoes" from "Graceland" were crowd pleasers; but most of the night consisted of traditional African songs and their own compositions. For most songs, a different member of the band would step to the front of the stage to sing lead, while the remaining 7 harmonized behind him. Some songs were accompanied by coordinated Zulu dances. The night concluded with a stirring rendition of "Amazing Grace". Ladysmith Black Mambazo has long been on my list of bands to see live. Now I can cross them off the Bucket List. Until the next time they come to town. I have a busy speaking schedule coming up. Here are the confirmed events as of today. An object is an instance of a class. A class is a template - or blueprint - that describes what an object based on it will look like and behave. Further, objects have a defined lifetime - they are created and eventually destroyed; not so with classes. Encapsulation is an OOP principle describing an object hiding its implementation details form the outside world. Inheritance describes a class that is derived from another class or from an interface. The derived class (or child class) inherits the properties and methods of the parent class or interface from which it is derived. Polymorphism describes to objects that can accept the same message (e.g., the same method call with the same parameters) and respond differently, but appropriately to that message. For example, a Customer class and an Invoice class may each have a "Print" method. Calling the Customer's print method could print a report listing details about the current customer, whereas calling the Invoice's Print method might print a specific invoice. Polymorphism can be accomplished by implementing the same interface in multiple classes. What is the difference between a Class and an Interface? Although each can serve as a templates for inherited classes, an Interface includes only the names and signatures of properties and methods, whereas a class also includes the implantation of each method and property. The world of Sunshine is filled with demons and werewolves and a variety of monsters. But the most dangerous creatures are the vampires - undead creatures who prey on humans at night. 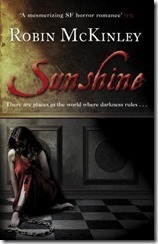 Sunshine is kidnapped by vampires and finds herself chained next to the starving vampire Constantine, who is also a chained prisoner of her captors. Together, they escape their prison. Sunshine returns to her life but the authorities and her family want her to explain where she has been and how she was able to escape from these creatures (No one ever escapes vampires). Throughout the book, Sunshine and Constantine and a few human and half-human allies fight a battle against evil and powerful vampires. Along the way, she finds herself drawn to Constantine and learning about her own powers. She wrestles with her identity as she can no longer live the simple life of working in a bakery. I liked the story and I liked the characters. Sunshine is strong, but flawed. The writing is sometimes rambling but that's ok, because it's written in the first person and that's how Sunshine thinks. Constantine is menacing and distant and alien. But he is likeable. And he strives to understand Sunshine, which sets him apart from the others of his breed. Sunshine is a good story for those who want a new twist on an old legend without the triteness too often associated with this genre. Today I am grateful for checks and balances and those who believe in them. Today I am grateful for a trip to Milwaukee, including a visit to the Milwaukee Art Museum yesterday. Today I am grateful for a chance to spend time alone with those I care about. Today I am grateful for high productivity days. Today I am grateful to the countless immigrants and children of immigrants who contributed to the greatness of my country. Today I am grateful for good dental care, good dental insurance, and healthy teeth. Today I am grateful for a Microsoft party last night at Shedd Aquarium. Today I am grateful I was able to attend Pam's funeral yesterday with Jim and his family. Today I am grateful to Sara for driving me from San Francisco to Oregon yesterday. Today I am grateful for all the crap I threw away yesterday when going through boxes in my closet. Today I am grateful to Dan for driving down to Champaign on his own time yesterday to help me help out me and some professors. Today I am grateful for a number of successful meetings with university professors. Today I am grateful for my new MacBook Pro. Today I am grateful to attend a Webb Wilder concert in Chicago last night. Today I am grateful for how much better my life is - in almost every way - than it was a decade ago. Today I am grateful I was able to get a last-minute ticket to the Microsoft Tech Summit at McCormick Place this week. Today I am grateful for the wonderful imagination of Neil Gaiman. Today I am grateful for lunch with Brian yesterday. Today I am grateful to see Buddy Guy in concert last night at his own club - Buddy Guy's Legends. Today I am grateful we made it home safely after a long drive yesterday. Today I am grateful to all who have built the #CodeMash conference and made it such a great event. Today I am grateful for the overwhelming generosity of the tech community. Today I am grateful for friends who want to help and support one another when tragedy strikes. Today I am grateful for: -A return to #MIGANG last night -Driving 400 miles in an SUV with 7 smart people -Jason driving our excess luggage to Sandusky, OH. Today I am grateful to find time to get together on a very busy Sunday. Today I am grateful for a full day with Tim Giard. Today I am grateful for an evening at Second City with Tim Giard. Today I am grateful for my first presentation of 2017 last night. Today I am grateful for the infinite possibilities of 2017! Today I am grateful for a desire to continually learn new things.